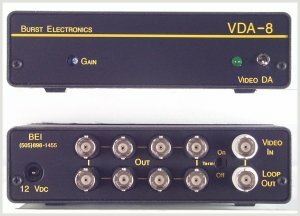 The VDA-8 has the same features, performance and specification as the VDA-4 except it has 8 outputs. There is a rear panel switch to select an internal 75 Ohm termination resistor on the loop through input. Size: 5.6 W x 1.5 H x 7.0 D inches.